Well, for once it really is 'all about you' and it's our role to ensure that you get the absolute best from your wedding day by providing the kind of wedding car hire service you expect from a wedding car company that depends on its reputation. So if you are after that Classic or Vintage car style, you can check availability online now or give us a call. To make it easier for you, you can check availability and get a quotation online; just select the button below. You are very welcome to come and see the cars, in fact we encourage it. We are open seven days a week by appointment so do give us a call on 0800 6118077. One of the most beautiful areas in the country, whether you are getting married or not! We maintain and provide a small fleet of the ever popular Vintage style Beauford Tourer, inspired by the Duisenberg 1930s classic. Naturally they are all long bodied four door models (giving room for the bride and partner as well as the wedding dress!) finished to the highest specification in classic pepper white with magnolia leather upholstery and walnut dash - it's a photographer's dream! 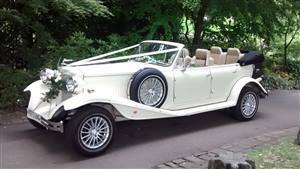 For that Classic Wedding Car look, the Beauford wedding car is right up there! Garaged here in York, you are very welcome to make an appointment to view our wedding cars, in fact we recommend inspecting your wedding ride, whatever you eventually choose to book. For young bridesmaids and pageboys we also have a Mini convertible wedding car which they just adore, giving them a share of the limelight in the wedding cavalcade. Cars are dressed with the ribbon colour of your choice, silk flowers and, of course, presented in the best possible way for your day. 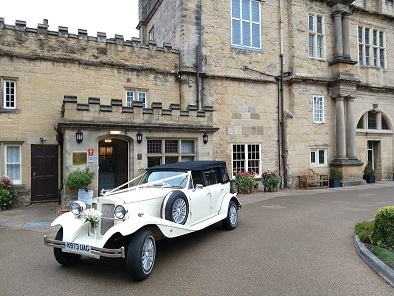 It's your day and every wedding is individual, so tell us what you would like and we will do our very best to fulfil your requirements for you wedding ride in Yorkshire. We all know how expensive it is to stage a wedding and paying for you classic wedding car does not help! To make things easier, we accept payment for your wedding car hire by credit and debit card. In particular we accept Visa, Mastercard and American Express. We have to make a small charge to cover the transaction fee, but if you feel uncomfortable about that, we accept Cheques and of course bank transfers. We can give you a quotation for your wedding car now, but wedding car prices vary and are dependant on the car, the day of the week, time of year and the duration of the booking. we can send you an immediate quotation by email - just complete the short online form and you will have your wedding car quote in a matter of seconds. The quotation page only shows wedding cars in your region that are available for your date. We are a small company giving a very personal wedding car service and we don't cover the whole country, but if you are looking for a Classic or Vintage Wedding Car in North Yorkshire, East Yorkshire or West Yorkshire, we would like you to consider us. We cover a radius of 50 miles by road from York including the towns of Harrogate, Wetherby, Leeds, Malton, Selby, Pickering, Scarborough, Pontefract, Ripon, Skipton, North Allerton, Thirsk, etc. So, get an Instant Quote and arrange to come and view the cars without any obligation. You would be very welcome! And if we don't have what you are looking for, be sure to look at our guide to hiring a wedding car. We supply wedding cars throughout the UK. To check if we supply your area, either get and instant quote or check our wedding car regions page.